Registration is FREE. Create a profile to search for all types of Nurses, specialties, CNA’s and post job opportunities. Your account allows you to search for candidates by, criteria, specialty, license and location. All correspondences with potential candidates is done though your account and stays within our system. From your account, request complete resume from candidates. Maximum 5 job posting at one time from your place of business on our job board. Go to your “My Account” page and click “Post Job” input job posting. Click on job package – it will take you back to “Post Job” – click on it again. Since we are allowing FREE job postings in order to over ride the check out cart you must click on “Post Job” twice. Once posted, review, edit or add additional postings on you “My Account” page by clicking “Post Job”. Participate in Hirenurses.com promotional events. Nurse staffing and recruitment means more than just filling a position. 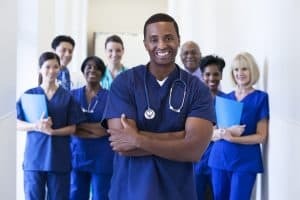 Whether you need per diem nurses for your acute-care facility, permanent staff nurses for your medical practice, experienced home care nurses, interim nurse leaders, or the flexibility of per-diem nurse options, HireNurses.com can connect you to the largest and most diverse pool of nurse staffing candidates in the country. We at HireNurses.com have built longstanding partnerships with nursing groups and organization allowing us a unique advantage to reach across the nursing community. We at HireNurses.com have Internal recruiters (also known as “in-house”). They are employees of HireNurses.com and they will represent your place of business for a fee. Nurse Recruiters, are here to be your personal matchmaker. Helping all our places of employment find the best candidates. Within our database each of our candidates has special abilities. We are here to find you that match, and make the largest positive impact on your place of employment. Email our personal nurse recruiters and schedule your FREE consultation. Our checks include comprehensive assessments to ensure each nursing candidate possesses the necessary training, license, clinical competencies, continuing education and up to date PPD, Flu shot and CPR training. We evaluate each candidate for your specific requirements to ensure the best fit for both you and the candidate. HireNurses.com is the only online platform dedicated to connecting employers directly with Nurses and CNA’s. Create your free company profile. Go to your “My Account” page and click “Post Job”. Your job is seen by candidates. Search our national, Nurse and CNA database by specialty, license & location. Keep notes on candidates you viewed and contacted. Nurses and CNA’s may also apply directly to your position. Contact candidates using our messaging system. Request full resume from candidates. Every time a new job is posted, we alert our network of nurses constantly finding you Nursing and CNA talent to apply to your position. We know that small businesses often struggle to connect with the best nursing candidates. Why? Often small businesses struggle to be found by nurses. Nurses can easily identify the big hospitals in the area, but are often unaware that just a few miles away there are many other great nursing positions at smaller facilities. At HireNurses.com we level the visibility of all nursing employers, meaning you too will connect with the best nursing talent on HireNurses.com. We know you have your own job boards, but sometimes still connecting with good nursing talent is a challenge. On HireNurses.com your positions are seen by Nurses and CNA’s nationally, allowing you to continue to build upon your pool of nursing talent, both actively by contacting Nurses and CNA’s directly and passively by having the apply directly to you. Plus so much more, if you are interested in attending, participating, sponsoring or co-sponsor one of our future events please contact: admin-nurse@hirenurses.com. Please don’t forget to follow us and join us on social media. Of the 120,000 nursing jobs posted a month – nearly 20% go without a single applicant. Prior to HireNurses.com, employers struggled to connect with nurses as there was not one site you could go to connect with nurses. At HireNurses.com we guarantee you connect with candidates! The United States faces a significant nursing shortage. According to the United States Bureau of Labor & Statistics the US will face a shortage of 1.05 million nurses by 2022 https://www.bls.gov/news.release/ecopro.t08.htm. In addition, according to a 2013 survey conducted by the National Council of State Boards of Nursing and The Forum of State Nursing Workforce Centers, 55% of the RN workforce is age 50 or older https://jnr.metapress.com/content/m61518mn5001m025. We do not have the nurses to replace those nurses moving into retirement, in 2008 the Council on Physician and Nurse Supply determined that 30,000 additional nurses should be graduated annually to meet the nation’s healthcare needs, an expansion of 30% over the current number of annual nurse graduates (http://www.physiciannursesupply.com/) which never took place. New nursing graduates leave nursing within 2 years of graduation further escalating the nursing shortage (http://www.minoritynurse.com/article/nursing-shortage-exploring-situation-and-solutions ).